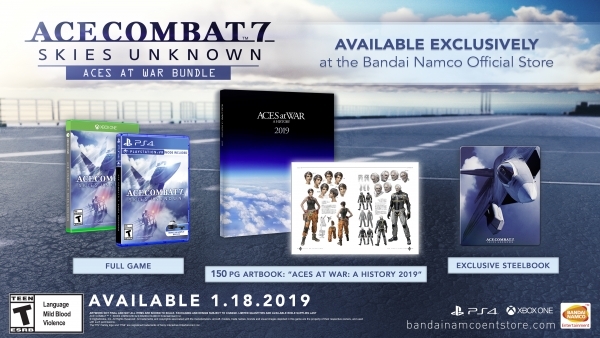 As we are about two months away from the release of Ace Combat 7: Skies Unknown for both PS4 and Xbox One, Bandai Namco announced today that an exclusive Aces at War Bundle will be released via the Bandai Namco Store. – A 150-page Aces at War: A History 2019 artbook that contains exclusive illustration, interviews, and four short stories written by Japanese writer-director Sunao Katabuchi. Since it’s been years since the last Ace Combat game was released, many fans of the flight simulation genre are definitely excited for this newest Ace Combat game. Those who are eager to play something that is Ace Combat, definitely look forward to this title when it hits next year. Ace Combat 7: Skies Unknown will be available for PlayStation 4, Xbox One, and PC via Steam on January 18, 2019.